The Quote is: Love does not make the world go round, Love makes the ride worthwhile! I have to redo the quote, I had to cut it in lines as the vinyl is not wide enough to cut it the way I want, so of course each line does not look even...but over all we really like the room. Charlie helped me paint and he spray painted all the black accent stuff, the fan, the new light we bought for my side, all the frames. I have Amanda's art work up, looks great! Charlie also took his closet apart and painted the frame, it was gold, now it is black and is so much better! I still need a few more items, I would like a different hamper. We bought new blinds for the window and new vertical blinds for the sliding doors and I added a valance for the window, all in all I am so happy to not have peach walls!! I have been wanting to tackle my bedroom project for along time, I am now almost over my exhaustion of the last two rooms I completed so I started on the bedroom this morning, I hope to have it done by sunday night...yeah when I dream, I dream big! I am going with teal, black, cream. Only one wall will be teal and it will have a quote over the head of the bed, not telling yet so don't ask, hee-hee! The other 3 walls will be cream and the accents (shelfs and hangers and frames will be black). So join me in another fun project here at Casa Viva Las Vegas! Here are the charms from the latest charm swap, the theme was Las Vegas, I was the host as we all know how much I love Las Vegas! Next swap, creepy scary halloweeny! Our Elvira of a host is Tanya! I can't wait to see what this creative group comes up with! Stay tuned!! 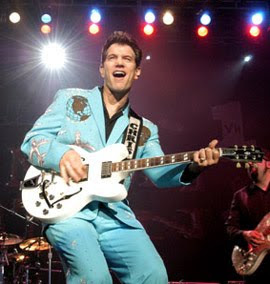 Last night charlie drove me and the girls...jerry, june, tanya out to primm to see chris isaak! He was funny and charming and sounded great as usual, this has to be about my 10th time seeing him and he never gets old, his music is great, some soft mellow songs and some rocking songs, some blues and he even did a little gospel, some oldies and some pop...if you ever get the chance don't pass up seeing him, his concerts are fabulous! A fun time was had by all! The kiwis are back from the salt flats, Alan did not break the record but will try agian next year! check out: Black Thunder Racing NZ for all the updates! I made dinner for us tonight, crab legs and shrimp scampi, salad with homemade cesar dressing, twice baked potatos and creme brulee for dessert...we are fat and happy and watched videos after dinner. We saw excitement from the salt flats (violets dvd) and I showed ethans dvd's of his 5 years, and mine and charlie's 20 year dvd..we laughed and had fun. I will share the recipes on my cooking blog. They will be here until tuesday so I hope we can have another dinner together! hmmm what should I cook??? Here is a new quote for my craft room wall, I got it for 6 dollars at the trade show, a lot easier then making it myself. Hey if you all have any great music lyric quotes send them my way, they may end up on my walls! I put a new recipe in the cooking blog...I am hoping to add another great suprising one soon as I get permission from the cook! Just click on the cartoon to the left. Some of the jewelry girls went to the jewelry/gift trade show at the sands convention center here in las vegas today. Me, Pat, Colleen and Tanya had fun walking around and looking at all the stuff. We were able to buy some stuff today as it was the last day and some sellers did not want to pack stuff up. Here is one deal I got, 3 suitcases with peace signs on them, all 3 for 60.00!! I love it! I will be traveling to Ontario in October for the scrapbook expo and I can't wait to pack up all my stuff in these cool bags! I love to light the tiki torches and sit outside in the evenings and watch the bats fly around, it is so serene out there by my pool. 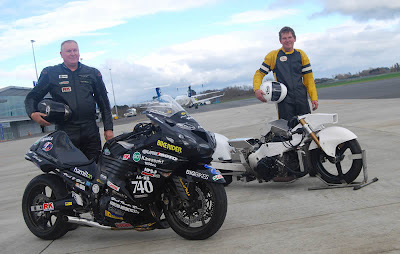 New Zealanders....this time we have Alan and Dean and two bikes going for records!! Alan and the crew are back again to try to break the record! They are getting the bikes ready, (my backyard looks like a motorcycle pit garage, which is real cool by the way!) and they will pack up the motorhome and be on the way thursday morning to the salt flats! My friend Colleen Mcgraw got me hooked! She bought an espresso maker online and started making some of us coffee lovers lattes, wow, they were yummy! But then I would go home and after dinner I would think boy, one of those latte's sure would be good right now! Well, I am not running to starbucks and spending 6.00 a latte! So while browsing walmart, I noticed this cute little espresso maker for 34.00, I bought my favorite coffee, Seattle's best decaf, and now I make my own lattes at home! I have even made a foamy heart just like a true barista! I think because I use the foam I am actually making a cappuccino, lattes are just espresso and steamed milk. I looked them up in the dictionary. Any real barista's out there correct me if I am wrong! Captain Phil and his sons will be here in Vegas Aug. 29th at the Gold Coast Casino, they are looking to interveiw people to be the next greenhorn to go out the boat with them! Fill out an application at www.captainphilharris.com then you will interview here in Vegas on Aug.29th! I hope to go get a photo with them!